The fifth religious holiday celebrates the birth of the Prophet Mohammed. Mawlid al-Nabi was celebrated two times during the year of 2015.
by the Merinid sultan Abu Ya`qûb Yûsuf an-Nasr. so observing Muslims will celebrate Mawlid al-Nabi on the sunset of the day before noted here. Two public holidays for government and the private sector. 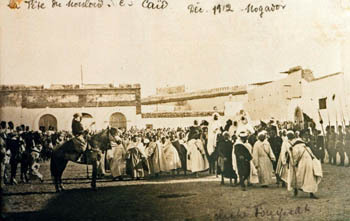 The Gnaoua brotherhood Sidna Bilal make a pilgrimage to Moulay Brahim on the occasion of Mouloud. Moulay Brahim or Moulay Brahim ben Ahmed Mghari (died 1661), also called Tayr Lejbel (Berber for 'bird of the mountain'), was a well-known Moroccan sufi saint. He was the grandson of Abdallah ben Houssein al-Hassani, who was the founder of the zawiya of Tameslouht, one of the greatest Zawiyyas in the region of Marrakech (founded ca. 1525). The zawiyya of moulay Ben Brahim was founded in 1628 during the reign of sultan Zidan Abu Maali in the village 'Kik', since called 'Moulay Brahim'. It lies a few kilometers to the west of Tameslouht. Eid Al Mawlid Annabawi Acharif, is celebrated by religious vigils organized in mosques and religious confraternities (Zaouiya). Eid Al Mawlid Annabawi celebrated throughout the kingdom takes on an almost mystical dimension in Salé, the twin city of Rabat, where the candles procession is organized since the time of the Saadian sultan Ahmed al-Mansour 1 (1578 to 1603 ).